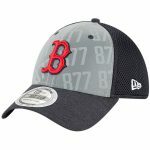 Give your young fan’s favorite look a subtle touch of Boston Red Sox team spirit with this exclusive The League 9Forty adjustable hat! This premium-quality gear features authentic Boston Red Sox graphics and is a great way for him to up his style like a pro anytime! He’ll be the envy of every fan when he rocks this sweet Boston Red Sox gear!